Presenting a handcrafted Democratic Party Christmas tree ornament featuring the donkey logo of the Democrats with authentic Swarovski rhinestones and acrylic stars. Ornament shown in navy blue. Choose from either navy, red, or royal blue when you add the item to your cart. Make sure you view our other political ornaments. 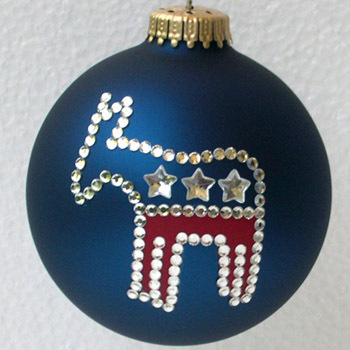 Democratic Party donkey Christmas tree ornaments with authentic Swarovski rhinestones can be purchased at Designer Ornaments. Democratic Party donkey Christmas tree ornaments depicting a donkey logo can be purchased at Designer Ornaments.